5 C 1 3rd fretfr. 3 C 4 5th fretfr. optionalopt. C5 power chord's notes: C, G and C. Only the 5th, 4th and 3rd strings can be played. The note C on string three is optional. Power chords are used extensively in all forms of rock music, and they sound the best when played on electric guitars with heavy distortion. 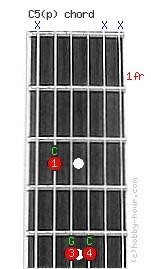 C5 (perfect fifth interval) power chord's alternative names: C(no 3rd), C(no3).